John Potter lives and teaches in the beautiful city of York which is ideally situated between two national parks - the Yorkshire Dales and the North York Moors, both of which provide him with a rich source of photographic material. A former winner of the Kodak and Country Walking Magazine Landscape Photographer of the Year and the Ballantine International Photographic Competition, John made his first black and white print way back in 1983, and since then has combined his love of the countryside with his passion for landscape photography. He likes nothing better than to be out with his camera on a crisp winter's morning waiting for the sun to rise. As well as the Dales and Moors, his other favourite locations are the coastline of Yorkshire, the Lake District, Northumberland and especially the Western Isles which he tries to visit at least once every year. John uses a 6 x 7 medium format camera for landscapes and a digital SLR for closer work such as the many agricultural shows, steam fairs, festivals and portraits. John produces images for advertising agencies, books, magazines, greetings card and calendar publishers, Ordnance Survey publications and for exhibitions and lectures. 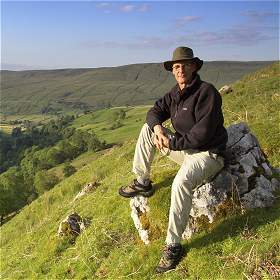 He is currently working on Yorkshire Moors and Coastlines to be published by Myriad Books in 2006.